The Ae of Wands is the first spark of raw creative energy. It is fragile and fleeting and must be acted upon quickly before its fuel is used up and the inspiration gone. The wands represent the element of fire, a miraculous element that needs the support of the other elements of earth, water and air. Fire needs wood and air to consume. In the wood there is also the element of water present as the wood was once a tree, nourished with water. In water we find feeling, passion and sensitivity. In air we have the forces of intelligence, structure, logic and imagination. In earth we find the resources to support and ground an idea and make it happen. The co-operation of all these elements is needed to move the energy of the Ace of Wands forward. In a work of art, for example, the water would be the emotion or what is expressed, the air the intelligent use of colors, lines, patterns and symbolism to convey the emotion of the painting. The earth element would be the actual canvas, paints brushes and tools used to create the art. Man is the only creature that is able to create fire. It is indeed his unique ability. Through the magical synthesis of emotions, mind and body, the creative vision occurs. Everything great and innovative started as a little flame. 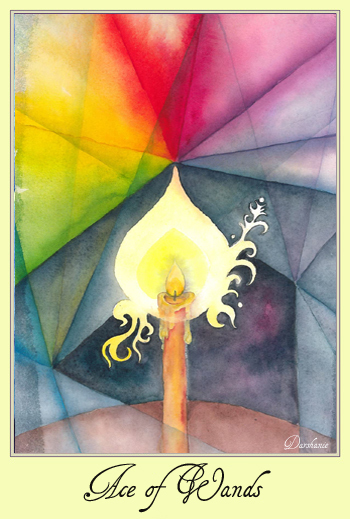 In the Ace of Wands, we have a brilliant flame. It creates light against a dark background the way creativity brings light and color into our lives. From the flames we see a sparks flaring, showing the excitement of creativity which is hard to contain as its nature is impulsive. It takes focus and discipline to direct and control. Within this card we see three points of radiation. On the right is the element of water with seven rays from the emotional realm. On the right is the element of air, also with seven rays of the mind radiating outwards. From the tip of the flame, the rays of fire radiate and overlap with other rays, creating new colors and patterns. At the bottom we have the solid support of the earth element, ever present and forming a base and firm support on which the candle can stand. This card speaks to the presence of new creative energy, a venture, an impulse or inspiration that needs to be supported quickly before the energy for it fades. 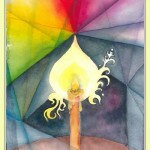 This entry was posted in Disks, Tarot on May 14, 2013 by darshanie.